All content (including text, photographs, and artwork is © Mary Jo Price-Williams. All of my designs may be used for personal inspiration only and may not be copied for publication, sales or contest submission . Monday Lunchtime Sketch Challenge 97! Re cap of Sketch Challenge 96! Isn't this the sweetest little magnet! Thank God for our Veterans! Another gift with matching card. Re cap of Sketch Challenge 93! Such an appropriate challenge for this week. Did you ever wonder why we think so much more about being thankful near Thanksgiving. I think we would be so much happier if we thought of what we were thankful for each and every day! I challenge you to do this for a while and feel the difference it can make in your life. The list goes on and on. One of the teachers at my son's school did a contest with her kids to see who could come up with the most items that they are thankful for. When I was doing lunch monitor there were about 10-12 who spent their entire lunch writing in a journal what they were thankful for--some of the kids were over 900 items at that time. I thought that was such a wonderful think for that teacher to do--really had them thinking. Anyway on to my card. It is a pretty easy one that I will be able to mail for the basic rate! I have been sending so many cards lately that I have been thinking about this a LOT! Hope you have an incredibly thankful day! Pretty! 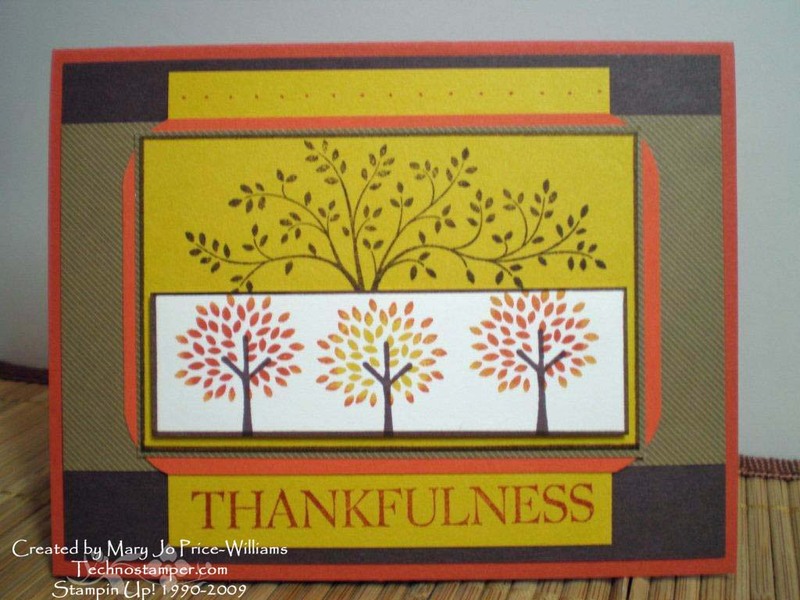 I love the colors, and the thankfulness stamp! Great layout. "Thank" you for your card and your words, MJ. Both are beautiful! Great way to pair up these images - wonderful choice of colors. Very nice card. Love the warm, inviting feel it has. Your words are so true. We all have "much" to be thankful for but often over look even the "little" things we have to be thankful for. Love the way you layered the trees! What a cute card! Nicely done! Hop on over to my blog to see my blog tour of Christmas items. Love these two images together. Great project!! Such gorgeous colors and what a great combination of images! What a great way to use to wonderful sets! I'm sure my LifeLinks group would LOVE this card--just might have to CASE it for Monday! I love your style, Mary Jo! Great card! step by step directions for 6 fresh new cards. Only $2.50 get it now! 5 unique cards and box with step by step directions. Easter Fun with the Flower Folds Die! Punch a Bunch and Ice Cream Parlor OSW Tutorial--Purchase now! Creativity is God's gift to you. What you do with it is your gift to God. God's "no" is not a rejection. Ask yourself: Have you been kind today? Make kindness your daily modus operandi and change your world. Our founding fathers knew what this world needed but do we?? ?